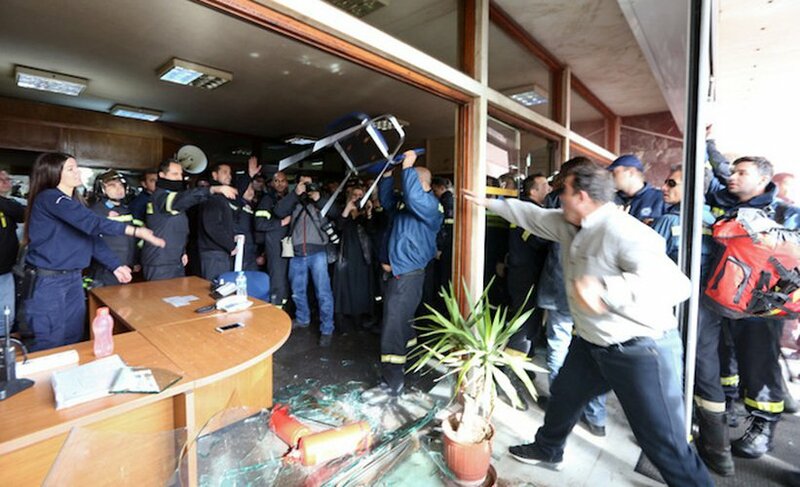 Representatives of the union of firemen hired on five-year contracts met with the director of Alternate Finance Minister Giorgos Chouliarakis in his office at the General Accounting Office on Wednesday, after holding a protest march in central Athens. The firemen are requesting permanent positions for 2,290 out of a total of 4,000 colleagues and the renewal of the contracts for the rest, which expire on Thursday. Earlier in the day, small scuffles broke out outside the Administrative Reconstruction Ministry after protesters were denied entry into the ministry and a meeting with Minister Olga Gerovasili. In a statement issued by the ministry, Gerovasili assured them that she is not challenging the legality of the procedures to grant them permanent contracts, adding that the ministry of Civil Protection will table a provision in parliament in the coming days, allowing them to continue their work without interruption.